Disk Image Viewer application is basically designed to open, read, and explore disk image file. It provides a preview of all type of disk image data files namely on Microsoft Windows operating system. 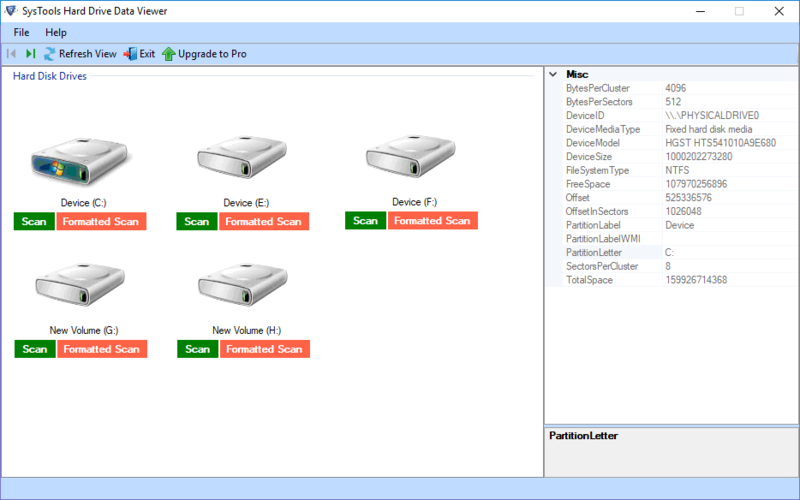 The Disk Image Viewer can be efficiently implemented on all versions of Windows OS likely, Windows 10, Windows 8.1, Windows 8, Windows 7, Windows Vista etc. 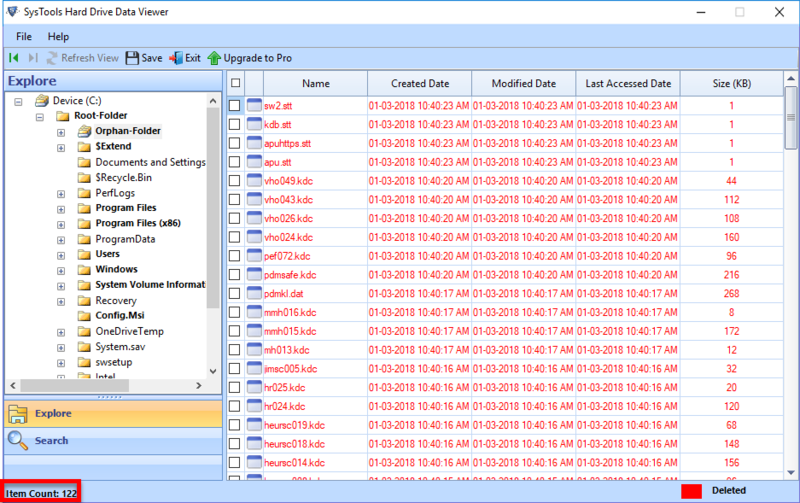 Disk Image Extractor tool is designed in such a manner that a user can open and read disk image file of all type that is, To do this, a user just needs to add & scan disk image data	file of any size to the software. After the scanning process, the utility will provide a preview of all data stored in those file without any trouble. One can easily open, view, and read any data stored in it. 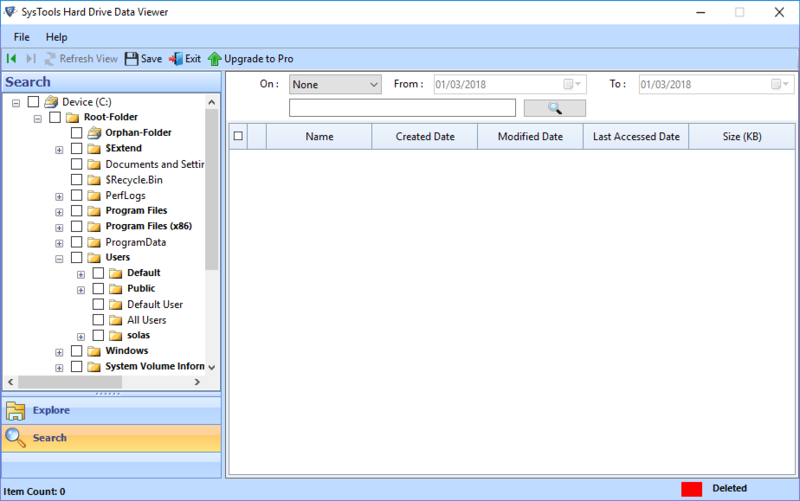 The best part about this free Disk Image Viewer tool is that a user can restore the deleted data items also from the disk image file. Apart from this, the software will provide a preview of all deleted data items in the red color within the application interface. Moreover, it maintains the data integrity throughout the process. 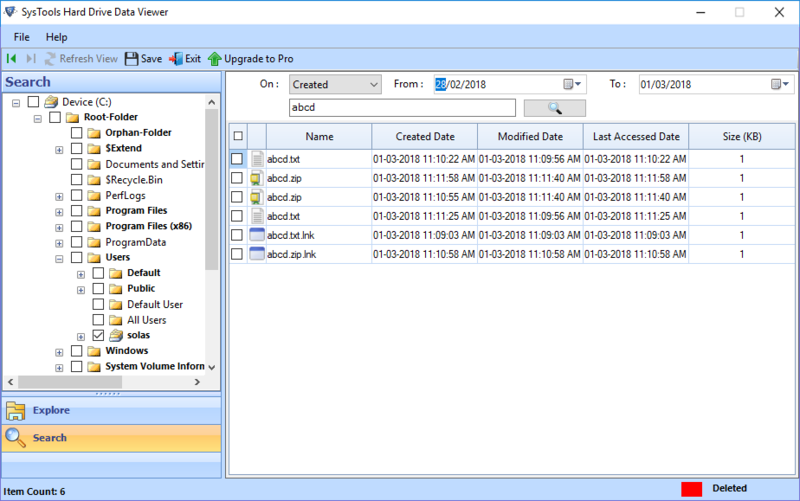 Another attractive feature offered by Disk Image Viewer is that it provides users an option to search for a particular file by typing its name in the search text field. One can use the date-based filter option to find specific data from a particular date range. A user needs to set the range in ‘From’ and ‘To’ field and the tool will show the files falls under that particular range only. As a user load disk image file to the Disk Image Explorer, it will first scan the file and then generate an instant preview of the file stored in it. 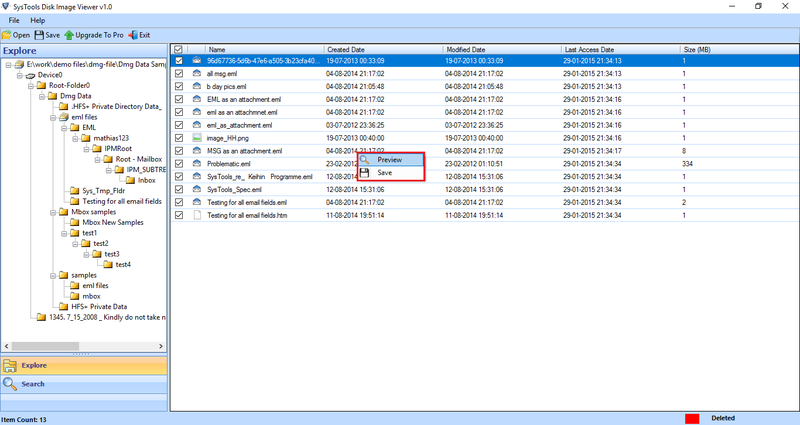 In addition, it provides a preview of all attributes like file name, size of the file, file path, type of file, etc. Moreover, if these files contains any data file in it like etc., the tool provides an inbuilt reader to preview all content stored in it. 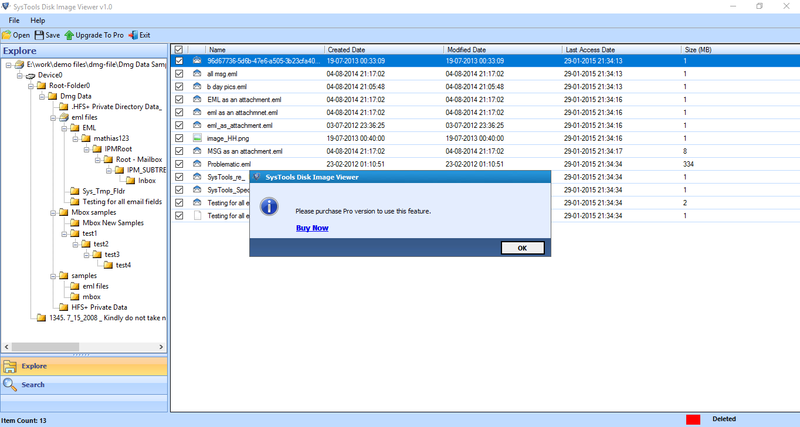 How to Explore files Using Disk Image Viewer? Step 11 : In order to save that file on the local machine, you need to buy the Pro version of the Disk Image Viewer product. As you click on the Save button, a message will pop-up stating " Please purchase Pro version to use this feature”. Q. Is it possible to open large size disk image file using this tool? Ans: Yes, a user can easily open, read, and explore any size disk image data file, including the . file with the help of this application. Q. Does the Disk Image Opener recover deleted data also from Disk Image File? 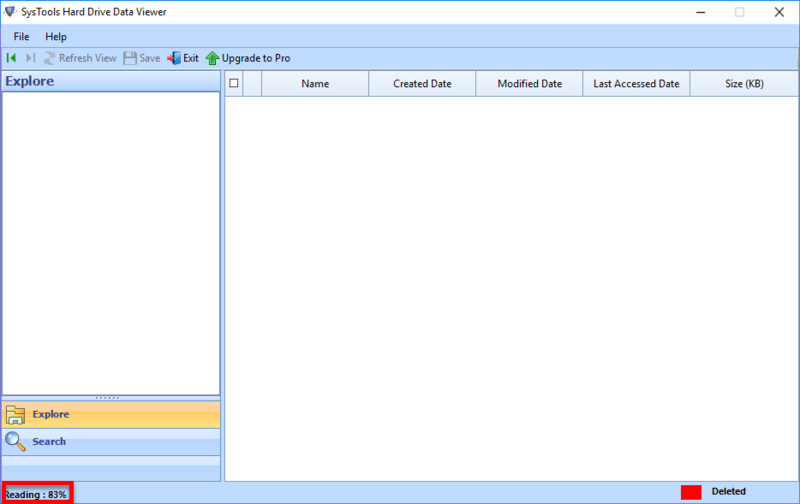 Ans: Yes, the Disk Image Viewer application is advanced enough to restore even deleted items from Disk Image file. Q. Does the product require any extra installation to be installed on the Windows platform? Ans: No, the Disk Image Viewer software is designed in such a manner that I do not require any extra installation to open and read disk image data files on Windows OS. Note: Disk Image Viewer Software will get delivered on your registered email id, within few minutes after placing the order. 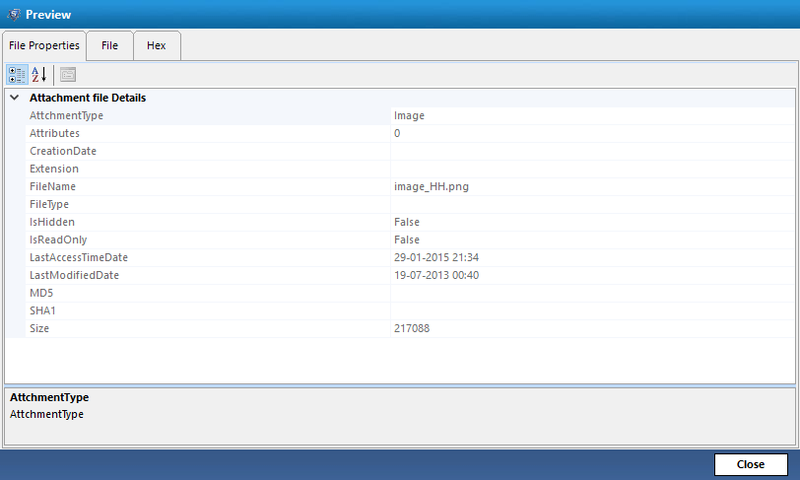 I tried this Disk Image Viewer application and open a different type of disk image files in my system. 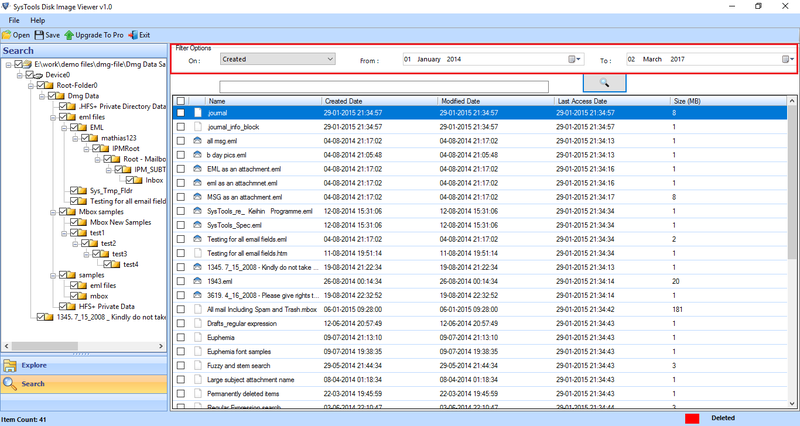 Viewing multiple types of disk image data files using single application is really amazing. Thank you so much to the developers for such a great tool. I am definitely going to suggest this tool to my friends also. The user interface of this Disk Image Explorer utility is so simple and easy to use that I did not find any difficulty in using this application. Moreover, it maintains the integrity of data after loading disk image file in the software. According to me, amazing work was done by the developers in developing a superb application. Free Disk Image Viewer to open disk image file of Mac OS on Windows OS is the best combination. Moreover, the product does not require extra installation to preview disk image data files on Windows platform. In addition, the tool does not impose file size limitation that also attracts users more towards it. Kudos! !